Dry Eye Treatment: What Is Available? The type of dry eye treatment will depend on the severity of your dry eye syndrome. However, such treatment will only treat the symptoms. Dry eye syndrome is an ongoing condition that may not be completely curable (depending on the cause). The treatment stated below are the medical dry eye treatment which is available today. If you are interested in less invasive ones or you prefer to handle the treatment yourself, consider reading my article on Remedies for dry eyes. There are two different type of artificial tears which you can add to your eyes. For most people with mild dry eyes, treatment will involve over-the-counter artificial tear solutions (eye drops) to help provide more moisture and lubrication for the surface of your eyes. Even though, they do not solve the problem, they do provide short term relief and comfort for the eyes. Though the ones with preservatives are cheaper and easier to store, it is best to avoid them as they will eventually make the dry eye condition worse. However, it is important to note that eye solution which doesn’t have preservatives is prone to contamination. And once contaminated, they can cause serious eye infection. Be sure to discard them if the drops have been exposed to air for more than one day. Eye drops provide rapid relief to the eyes but the beneficial effect do not last long. 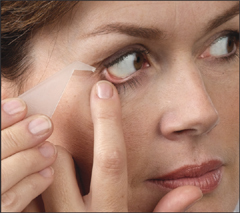 Lubricating gels and ointments have higher level of viscosity (thickness) and are retained in the eye longer. They are especially helpful for people who sleep without their eyes fully closed. However, because of their thickness, people do complain of temporarily blurred vision from the drops. Therefore, they are typically used to lubricate the eyes overnight while you are asleep. Generally, there are three type of medication available. For people who can’t use artificial tears, they can consider a tiny eye insert called Lacrisert (hydroxypropyl cellulose). This insert which looks like a clear grain of rice is placed just inside the lower eyelid. Cellulose is contained in the insert which acts to stabilize and thicken the film of tears over the eyes and to prolong the time the tear film works. Throughout the day, the insert dissolves slowly and continuously releases lubrication for the eye. The insert is similar to a contact lens and is inserted 1-2 times per day and it must be properly inserted, otherwise corneal abrasion may occur. The eye is incapable of maintaining healthy tear film when the cornea is infected. Restasis (cyclosporine 0.5%) may help to decrease inflammation on the cornea (surface of the eye). It also helps to increase your tears production with continued use. However, this medication is costly and patients often complain of burning sensation when applied. It also takes time to see result. Patients being prescribed Restasis are usually directed to take it for a minimum of 6 weeks to 3 months in order to determine whether it will benefit them. 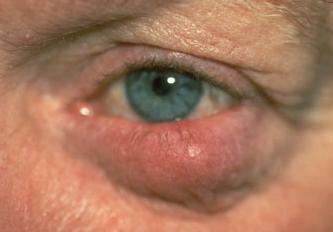 Some dry eyes are caused by inflammation along the edge of eyelids such as rosacea. The inflammation prevents the oil glands from secreting oil into tears. If you are in the similar situation, your doctor may recommend you to take oral antibiotics to reduce the inflammation. Antibiotic ophthalmic ointments are commonly used for people who have blepharitis and meibomian gland dysfunction. The ointments are applied at night for several days to decrease the number of bacteria that break down the lipid layer of the tear film and also lubricate the eyes overnight. Here are some treatment methods that do not require any medication or surgery. They are not home remedies though. People with severe dry eyes may opt for special contact lenses. Bandage lenses or corneal shields are commonly used in LASIK surgery. Even though their main purpose is to prevent infection, it can also help to trap moisture close to your eyes in order to relieve your dry eyes symptoms. Ask your eye doctor whether these special lenses are an option for you. Blocked oil glands reduces your lipid layer. A new dry eye treatment (not available everywhere) called LipiFlo thermal pulsation can help to clear blocked oil glands. During the 15 minutes treatment, a device that looks like an eyecup is placed over your eye. The device then delivers a gentle, warm massage to the lower eyelid to loosen the oil glands. Results usually shows within a few days. For severe dry eyes, one of the most popular dry eye treatments is punctal occlusion. To understand how punctal occlusion is done requires some understanding of the tear physiology. 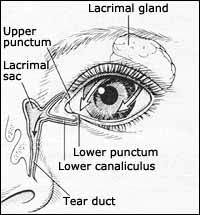 There is a lacrimal (tear) drainage duct in each of our eyelids. These ducts are found one in each of the eyelids near the inner corners closest to the nose. The hole in each eyelid connecting to the ducts is called the punctum. Tears drain from the eyes into the nose through the punctum which explains why your nose runs when you are crying as the nasal (nose) passages drain off excess tears from the eyes visa these drainage ducts. To conserve your tears or artificial tears which you have added, your doctor may recommend you to get the punctum is plugged. Temporary or permanent silicone plugs can be inserted in the eye doctor’s office through a nonsurgical procedure which is both painless and reversible. The treatments mentioned below will require certain level of invasive surgery. Sometimes, in severe cases of dry eye syndrome, your doctor may choose to permanently close your tear ducts. This type of treatment for dry eye is done usually by cautery (burning) or laser. This accomplishes the same thing as the plugs, but it is very difficult, if not impossible, to reverse. Some diseases, such as Bell’s palsy(a form of facial paralysis), can cause difficulty in closing one’s eyes. In such situation, the exposed surface area causes the eyes dry out quickly due to tear evaporation and this can’t be helped with any of the methods stated above. In this case, the only dry eye treatment is to have a surgery called Lateral tarsorrhaphy. 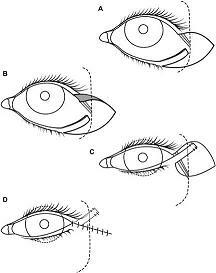 In this surgery, the lateral (outer) edges of the eyelids are sewn together to narrow the distance between the upper and lower eyelids. This helps the eyes to close more easily and decreases the amount of exposed surface area of the front of the eye. If stroke or nerve damage keeps the eyelids from closing properly, a small gold weight may be implanted into the upper eyelid to help it close.